If you saw my piece on Irish beauty brands in Xpose magazine you'll know just how impressed I am with Nima Brush. These beauty brushes are on par with MAC's but at a much more reasonable price point, and have become an essential part of my daily routine. They wash and wear well and the strong, sturdy handles and super soft brush heads mean they're an absolute pleasure to use. And the latest addition to the NIMA Brush range, the Elite collection, is no different. If anything, I like it even more than the Professional range because the new brushes just look so pretty, with their shiny rose gold ferules and even chunkier white handles. 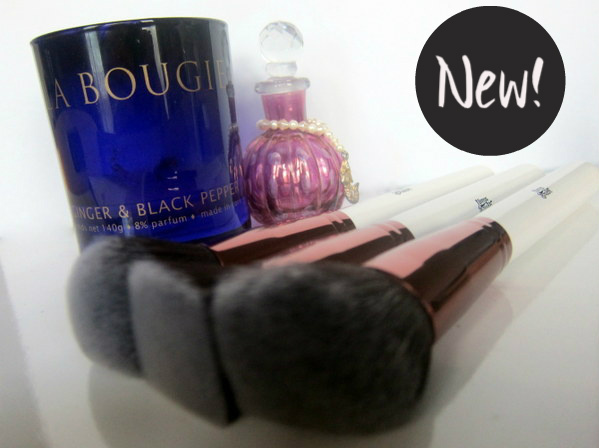 They fit really nicely in my hands and the three kabuki brushes I was sent have quickly become firm favourites, creating a foolproof, flawless base in no time at all. They're well priced, too with this trio coming in at €35, a trio of duo fibres being offered at the same price and a 5 piece eye set priced at just €25. The whole kit and caboodle can be yours for €105 which includes 12 brushes, and a sturdy cylinder to house them in. Check out the website or Facebook page for more, and tell me - what's your very favourite beauty brush brand? Emma, they look awesome! I love a well made brush! They look amazing and so pretty! Seems like they are so comfortable. Glad I’ve found this and definitely I’m going to buy this. Wow,those are priced really well and I love the rose fold accents! I have the NIMA 12 piece set & love it but now I want to try the Elite ones too! The brushes look great! Love the design. They look so soft! And elegant! The brushes look very soft <3. Hi dear, how are you? I really need to get new brushes, these look perfect! Wow! I love how colourful these brushes are and that it's an Irish company. Great price points too. I've been using the Real Techniques brushes since they were released and I really love them. They are inexpensive and work so so well. There are a few brushes from other brands on my wishlist though. I haven't gotten my dream collection yet! Pretty brushes and a great review. I don't think I have a favorite line. I have a hard time committing to just one brand. Ooooh AND they look so pretty! I absolutely love the handles and the colors! They look nice, and I love the rose gold part of the handles. Quality beauty brushes are so helpful and a must! I love new makeup brushes. Makeup goes on so much easier! Love the look of these! Gorgeous! gorgeous brushes! They look really high quality too! I need to update mine soon, they're getting old. I've been waiting for the rose gold for what seems like forever! They shall be added to my wish list right now! I've yet to try Nima brushes, they sound very promising, hopefully I can get some soon!